The goal of a feng shui dining room design is to invite abundance and health luck. The best colors for this room create a relaxing ambiance for a wonderful dining experience. 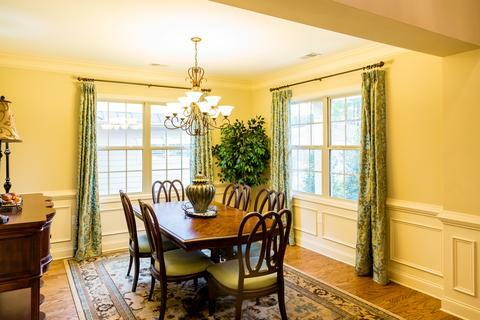 The earth element color yellow (northeast and southwest sectors) is softened for a dining room with a daffodil or pale lemon as the main color choice. Pale colors help to promote relaxation and calmness that aid proper digestion for good health. Choose fabrics with two accent colors, such as green and pink, to go with this color. Add gold, a metal color (west and northwest sectors), for color depth and a symbol of wealth and abundance luck. Another possible design includes a yellow and gray floral wallpaper above a white chair rail. Lavender or periwinkle (southeast sector) provides a backdrop for a soft soothing dining room. Use this color with wood element colors green and brown for a restive design. Add a yellow accent color for a grounding earth element hue. 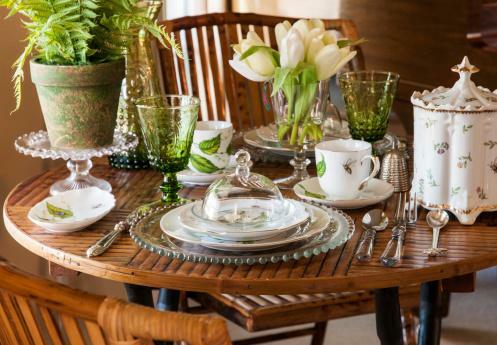 Refreshing colors, such as sage or tea (wood element colors) are especially ideal for east and southeast dining rooms. Green-tinted walls with medium to dark flooring can be contrasted with light-colored dining furniture. Create a dramatic décor with a darker green accent color mixed with other wood colors, such as chocolate or chestnut. Rose or blush colors give a hint of the stimulating red color (south sector) without overpowering. Add restive pale green and tan accent colors to this main color for a balanced, relaxing effect. Choose accent colors that are slightly darker or lighter than rose to add depth for a balanced feng shui design. Paint an accent wall in a slightly darker pink. If paint isn't your choice, go with a wallpaper for the entire room or one wall. The calming colors buff or sand are ideal for dining rooms, especially for the earth element directions southwest and northeast. Other feng shui dining room hues can be added for depth and dramatic effect. Paint the walls a buff or sand color with soft white trim. Add dark stained wood flooring covered with a plush sand-colored area rug. Dark brown dining furniture will create a stunning contrast while repeating the floor color. Use the other earth color, yellow for a striking accent color. A soft peach or melon main color for your dining room will add warmth while providing a soothing ambiance that's perfect for leisurely dining. Use a darker and lighter value of this color for monochromatic dining décor for this south sector color. Introduce a dark brown for an accent/contrast color. This wood element color (east) is a great choice to fuel the fire element (south). Accent colors can be either a lighter or darker value of the main color. You can still maintain the desirable relaxing ambiance while creating greater interest and depth. Select tablecloths, placemats, napkins, china, wall art, bowls, trays, dinnerware, vases, and accessories to reflect accent colors as well as the main color. Green plants with round or oval leaves (avoid sharp pointy leaves) and fresh colorful flowers are always great ways to add colors to the dining room. Black and blue are water element colors. As a yang energy, the water element is considered too stimulating for a healthy dining experience. When selecting feng shui colors for a dining room, consider ones that evoke an emotional response of warmth (soft and deep hues) and happiness (cheerful colors). Using restive colors translates into a healthy family with a life of abundance.